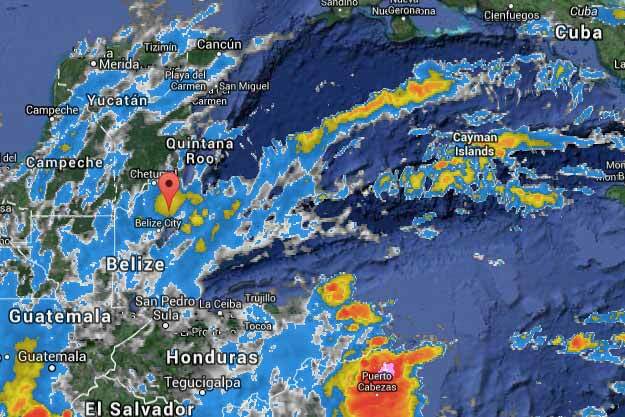 Belize NMS: Relatively moist conditions prevail. However a gradual improvement is expected the next 24 to 48 hours. 24-hour forecast: Cloudy to overcast skies with a few showers, periods of rain and isolated thunderstorms occurring mainly over central areas today and over the south and coast tonight. Some showers, isolated thunderstorms and periods of rain will continue over most areas tomorrow morning. 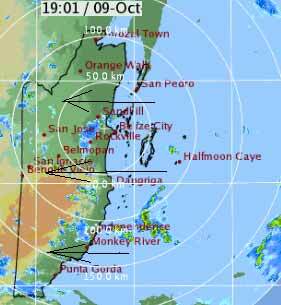 A few showers and isolated thunderstorms will continue along coastal areas,but less for inland areas. Winds: East - northeast 10-20 knots. Becoming gusty near heavy showers or thunderstorms. Today: Winds: NE'ly 5-15 kts. ; seas: Choppy. ; waves: 3-5 ft.; a few showers, periods of rain and isolated thunderstorms. Tomorrow: Winds: NE-E 5-15 kts. ; seas: Light chop - choppy. ; waves: 2-4 ft.; isolated showers or thunderstorms. Marine Outlook: Friday night:- Winds: NE'ly 5-15 kts. ; seas: Choppy. 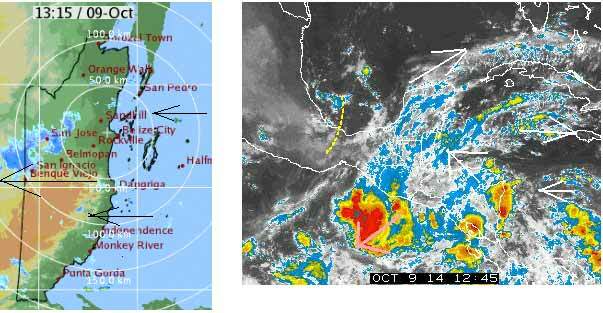 ; waves: 3-5 ft.; isolated showers or thunderstorms. General Outlook: For Thursday and Thursday night is for cloudy skies at times with a few showers and isolated thunderstorms mainly along the coast and in the south. Tropical Weather Outlook: Tropical cyclone formation is not expected in the North Atlantic, the Caribbean Sea, or the Gulf of Mexico within the next 48 hours. 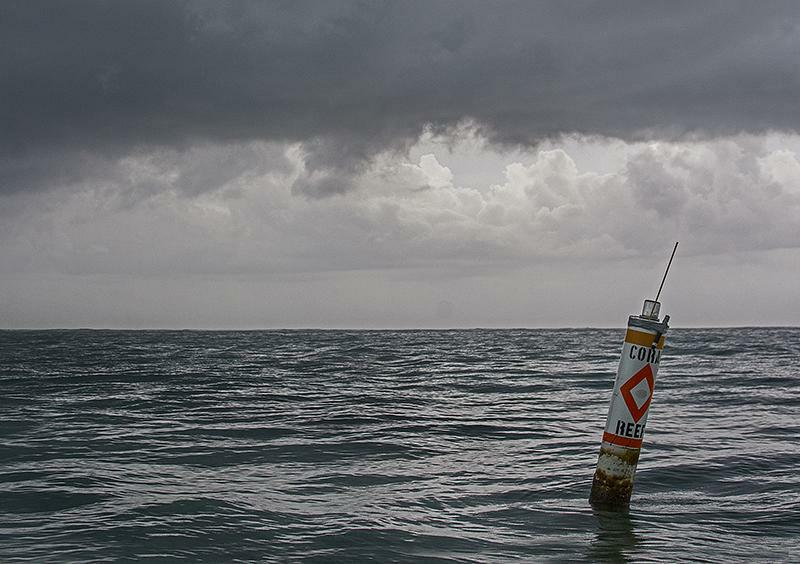 On Ambergris Caye this morning we have heavy rain and thunder but with calm sea from a slight Northern wind placing the dive sites in the lee of the island. Our expected high is 87. Looks like the worst of the Rain is now passing, I recorded 8.8mm ( 1/3" ) last night. . . . .The 400 km Radar was picking up a little rain way out, but that has also dried up. . . . So it is looking like a mainly Overcast day today, perhaps a little rain but clearing up later and possibly a little sun. #1 - Area of disturbed weather now Invest 99L is expected to pull northwestward and northward and possibly impact Bermuda this weekend as a tropical storm. #2 - There is a tropical disturbance over the far eastern Atlantic which is expected to push westward & has a chance to try and develop next week as it tracks towards the Lesser Antilles. 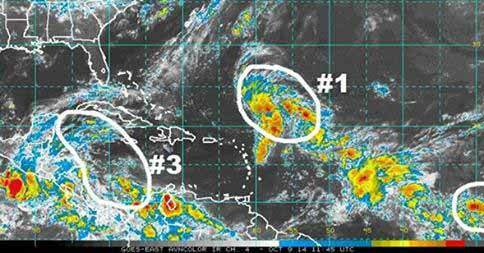 #3 - The Western Caribbean where climatologically it is an area that needs to be monitored closely during October. Development is unlikely for at least the next few days, however, it is an area that should be watched because the Madden Julian Oscillation is heading into a favorable phase for development over the western Atlantic within the next 7 to 10 days or so. It should be noted that the last couple of model forecasts from the European model have hinted that an area of low pressure may form over the northwestern Caribbean late next week or next weekend. So, it is an area that may need to be watched as we get into the later parts of next week. Scattered showers are around. . .. More than this morning.